When I ran across the headline about Conan O'Brien getting hurt doing a stunt for his show I was reminded that Anderson had been a guest on his show a couple of times. I dug through the video collection and ran across this really funny one from a March 2007 interview on Conan's show. Subjects include prostitutes with shiny shoes, a sloth giving the finger, AC saying "Jean Claude Van Damme" with an Afghan accent, and other items. Enjoy! Great post Quitty. 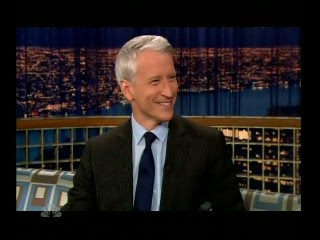 Anderson needs to go on Conan's show more often. I think Conan is absolutely hilarious. The best part of the interview was Anderson talking about the sloth. Totally adorkable when he was mimicking the sloth falling from the tree. And I love that pretty much all he learned about sloths is that they go to the bathroom about once every 10 days. Typical Anderson though. He tends to remember the oddest things. I like that about him. I really never got Conan's humor. I do remember this interview, however and it was one of the better ones. Hope Conan is better. Happened to look at some of the comments that were made on the 360 site, and quite a few recognized AC's nervousness during the Clinton interview. I guess it was evident because I made comment of it as well.